People on the net have written a lot of interesting things about making good dungeons, so what was once considered either a past embarrassment or a lost art is now a fairly well mapped field. It is hard to say anything new – and I won’t – but there is value in restatement and elaboration. Therefore, this post talks about dungeon entrances. One of the cool things about Necromancer’s Rappan Athuk is how, right at encounter number one, you discover there are two ways you can enter the dungeon. There is an ominous mausoleum ringed with several green gargoyles, and right next to it is a well that disappears into the darkness. You recall one of the rumours you heard at the tavern, which told you to stay well away from that thing. Still, what could go wrong? You ready a coil of rope and start to hammer a spike into some rocks to aid your descent. More than anything, “Don’t go down the well” is the hook that defines the Rappan Athuk experience, and frames it right from the start as a place where you can push your luck and get brutally punished for it. There are other entrances to the dungeon you can find later, but none of them have the iconic, evil simplicity of that initial impression. This is “Don’t go down the well” land. The idea of multiple access points to the dungeon go back to Castle Greyhawk, whose known entrances are well documented by Allan Grohe: the castle ruins, an old dry cistern, under a pool of quicksand, a simple hole in the ground, the Greyhawk city sewers (a pretty damn big dungeon level on its own), and so on, a fascinating list that only deepens the legend. A similar variety and richness seems to have characterised the yet unreleased Jakkalá Underworld. Some entrances would allow players to access several different areas of the dungeon complex, including one of the “main thoroughfares” which allow characters to access the deeper sections (see T. Foster’s description on Dragonsfoot, or “The Orcian Way” in Dave Arneson’s First Fantasy Campaign); others would perhaps be linked to more obscure and out of the way dungeon areas, and used much less often. 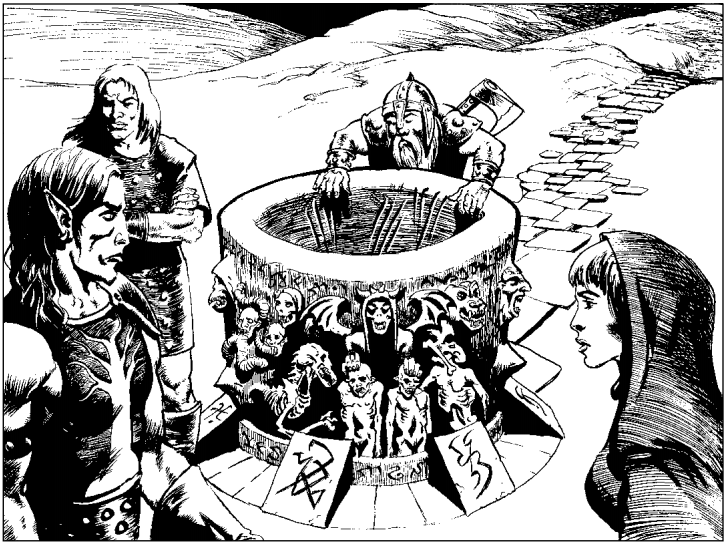 In contrast, Ruins of Undermountain has one notable entrance in the form of the Yawning Portal, opening right from the common room of the inn built on top of the thing (what could go wrong? I have a few stories about that, too...) There are others, but they barely register: you can somehow reach Skullport, the evil smugglers’ town on level 3, through an underground river, but has anyone done that? Similarly, the late Gygaxian Temple of Elemental Evil is not an accessible dungeon: in fact, for all the evil that goes on inside, it is ridiculously hard to actually get inside and start exploring. With the increasing linearity of dungeon design, and with the declining notion that dungeon space is reusable (and indeed, that it should be reused! 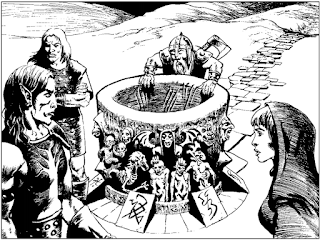 ), alternate entrances fell by the wayside, reducing the variety of play and removing one more tentpole that kept megadungeons a viable and entertaining adventure genre. And as it goes, you can always knock out a pole or two and leave the structure standing, but at one point, it is going to give, and you will be left wondering what had ever held up that old thing. This is not to say all dungeons should have multiple prominent entrances. Lair dungeons – relatively small, fit for anything from a few hours of play to two or three expeditions – can easily get away with one entrance, and maybe a few exits discovered along the way. Similarly, sometimes the fiction of the dungeon dictates limited accessibility: if the discovery and unearthing of the entrance is part of the challenge, then it is appropriate to stay with one entrance only. But for large dungeon complexes with much traffic going on, different factions and multiple large levels, the one-entrance principle can become very limiting. This is one of the few criticisms I would level at the otherwise excellent Anomalous Subsurface Environment – that it only opens up as the player characters venture deeper inside it, instead of offering multiple accessways already in use by multiple parties, or to be found out in the wilderness. There is a lot of unexploited potential in multiple entrances. This brings me to the final point, the accessible dungeon as a prominent dungeon structure (or layout type). There has been a lot of useful discussion on non-linear design counterbalanced by chokepoints, but what if the dungeon (or a section of it) is radically opened up? Part of the answer to that question is found in the Caves of Chaos, with its collection of monster lairs, connected in the back by clever tunnels and secret passages, and letting you get into lairs in complicated and unexpected ways. However, the caves do not really link to a common dungeon system, and mostly remain isolated cul-de-sacs. A few years ago, I experimented with a dungeon that had many entrances, and yet also had an internal core area, which would allow for a highly non-linear and variable play experience. 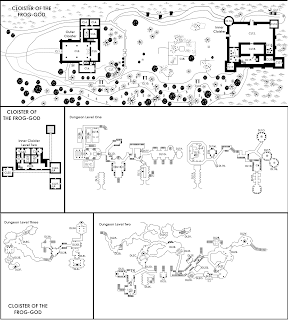 The result was Cloister of the Frog-God, stocked with the rooms I had originally developed for the lost Tegel Manor manuscript, and published by Frog God Games as part of their immense Rappan Athuk omnibus edition (where it kinda became lost in a whole heap of other stuff – I wonder if anyone at all has run or played it). Cloister of the Frog God is very far from a true megadungeon; in our home game, it took three sessions to come to a conclusion (with the characters fleeing in panic after poking where they shouldn’t have and unleashing the frogocalypse), although this was with a big chunk of the complex left undiscovered. Yet Cloister also demonstrates a possibility of dungeon design that could be very useful for the entrance level of a true megadungeon complex. One purpose of entrance levels is to “distribute” traffic into various deeper sections, and lead to more clearly separated layers of the whole dungeon structure. Multiple entrances begin this sorting activity right on the surface, and also keep the dungeon open enough for the benefit of the several different interest groups who have a stake in it. This is not to say this entrance level needs to be a wide open area. 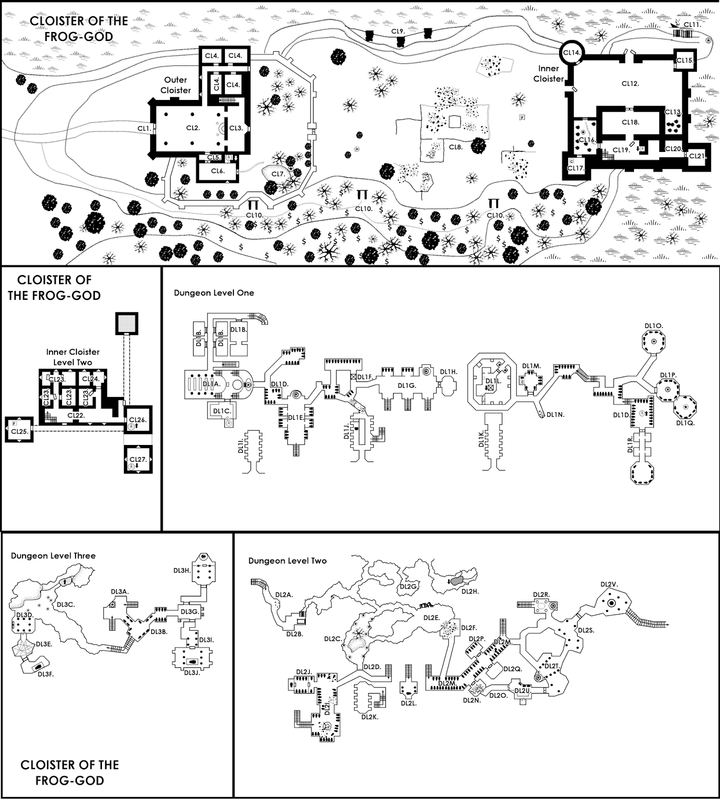 One of the reasons Cloister was successful in play was that while the exterior was accessible (in a sense – the entrances were either guarded or relatively more challenging to find), the interior was more tricky to navigate, with strong chokepoints, obscure connections, and multi-level mapping puzzles. This move “inverts” the dungeon level, turning it inside out, and poses an interesting set of challenges for the exploring party. I agree the structure you outline is very interesting, and particularly well suited for cataclysmic confrontations. You have multiple approaches and a sense of accomplishment when you complete a "stage" (also very gamy). It can go wrong, though, if the players are hung up on perfectionist planning, Shadowrun-style. That really kills the momentum. For the recipe to work, the players have to be smart, but they also have to be reckless. I really love the idea you present where one entrance to the dungeon is more obvious but well guarded, while a second one is hidden but presents an easier opposition. It rewards exploration and that is a good thing IMO. I will implement it in a next adventure. In our Dwimmermount campaign it is usually up to the Caller (one of the player roles chosen before each session) to decide when it is enough. Now, since each player is different, there are ones more prone to perfectionism, but there is one player in particular who never lets the game go dull because of this (unless he himself is tired). With him in the leading seat, they explore the place in a very satisfying pace. Thanks, Allan! Will respond there.